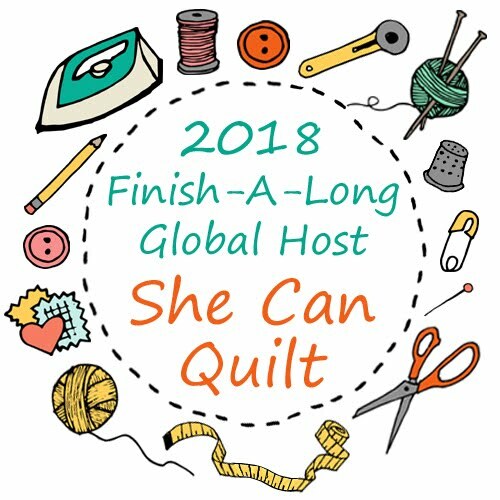 she can quilt: Landmarks, 2 - Ta Da! I am very proud of this little happy quilt. Here is her story. 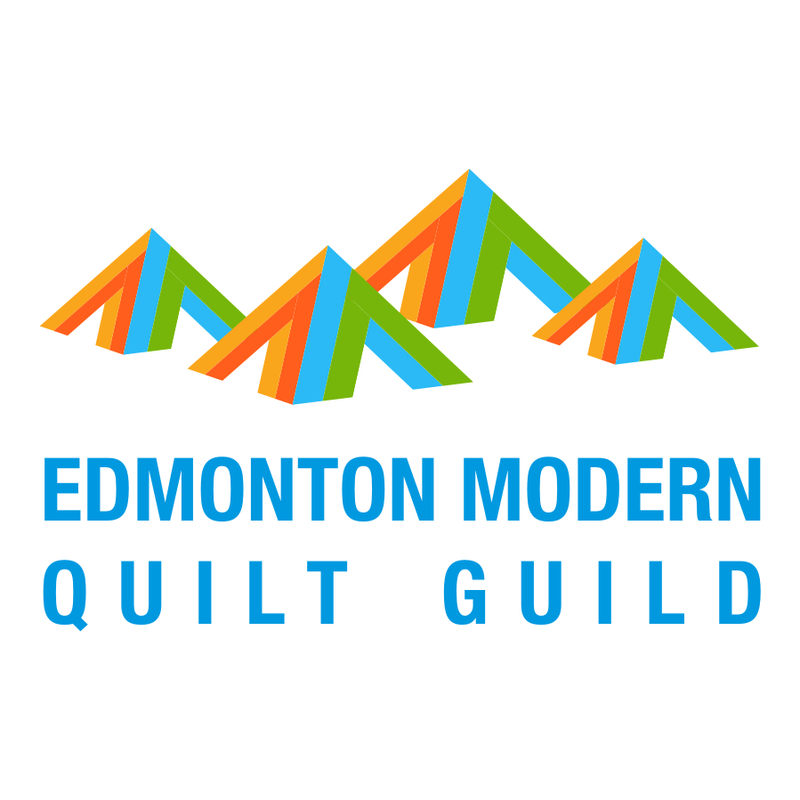 This summer I was received an email from the Canadian Quilter's Association inviting me to participate in a new project. They are hosting a travelling exhibit of mini quilts that will be shown across Canada. The show is called "It's Time for Colour!". I was so flattered to be asked to participate and of course I signed up. For a very long time I had no idea of what to make. I knew, for me to be happy, I needed to make something with a real modern look, as I expected that modern quilts might be under-represented in the exhibit as they are seem to be in other shows. The reason I was invited was because my quilt Sunset won the modern category at the CQA National Juried Show in June of this year, so modern also seemed to be the right focus for me. But, the quilters in this exhibit are described on the Canadian Quilter's Association Blog as "elite quilters; masters of the art". OMG - I was frozen, I felt like such a poser. As I pondered, amid the fear that they would figure out I did not belong, I kept coming back to that quilt above, Landmarks. It is modern, it is a design that I want to play more with, it is colourful, and it worked as a mini. The "It's Time for Colour!" 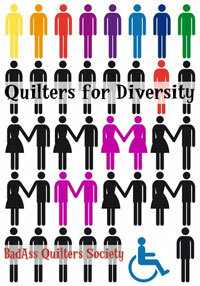 mini quilt will be displayed at various venues across Canada to promote quilting. The travelling nature of the show made me also think about maps and landmarks, and the idea of "You are here" that we seen on maps, generally marked with an X. It all just seemed to work together nicely. 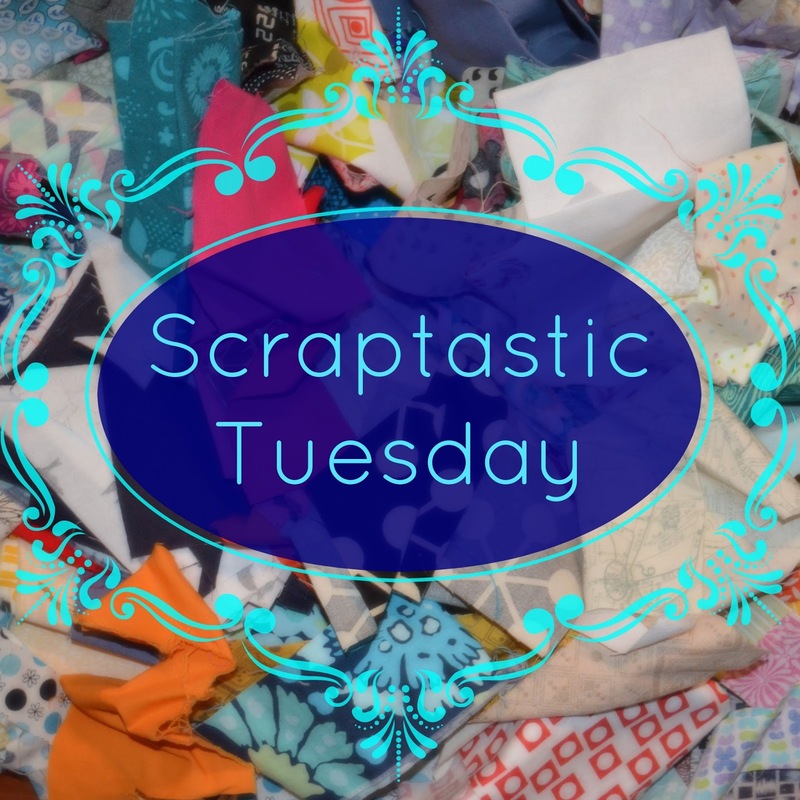 Then about a week ago, I was looking at that pile of scraps on my floor, thinking about Scraptastic Tuesday and I just started making some Xs. I cut some squares of various sizes out of some white Essex linen (it is a 50-50 cotton linen blend) and picked some bits of fabric from the floor. 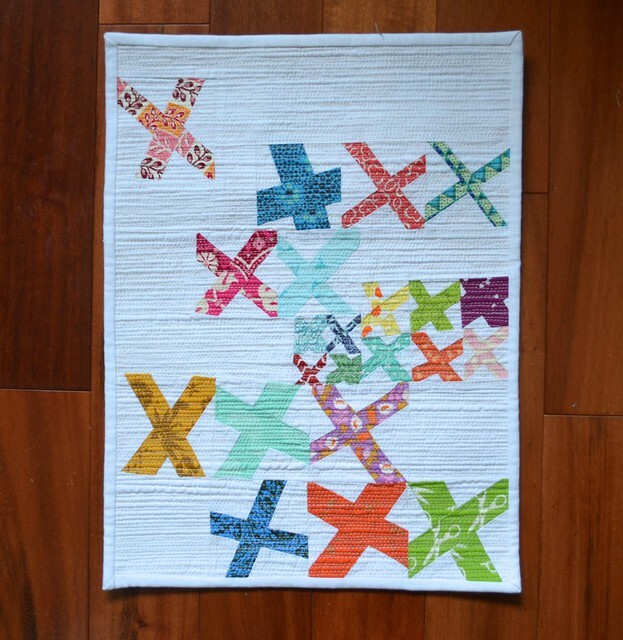 I made an improv X and then trimmed it to a square again. This continued over a couple of nights, encouraged by my friends on instagram. I was pleased at how much more colourful the pieces looked when I worked on it in the daytime last weekend. This mini had to finish at 12" x 16" so I played with arrangements. Then I started adding in the missing background parts. This is a bit of a trial and error process. Also, despite the fact that my seams look straight, I knew that it is not likely that they would stay that way as there is a lot of stretch in the blocks as the pieces are all cut on the bias. 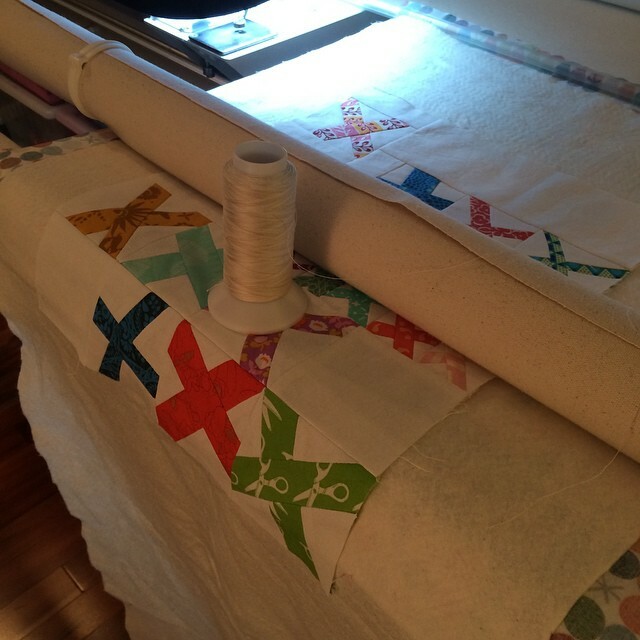 When I bought my long arm machine, I was determined to use it for smaller projects too, not just big quilts. I wanted to do the densest possible matchstick quilting I could on this mini and so the long arm was a distinct advantage for that. It took less than 2 hours to load the back, batting, and quilt, clean and oil the machine, wind bobbins and quilt the mini quilt. You can see that I picked a slightly variegated Superior King Tut cotton thread. This was an early shot of the quilting, you can already see how the improv bias cut imprecise piecing causes some draw in which distorts the seams and is in danger of puckering. For me this is all part of the design process - I am going for a rugged, industrial modern look (think brick warehouse with open beam ceilings). That picture is before I washed the mini. I learned a lot making this mini. First, despite knowing that matchstick quilting creates a lot of draw in, I neglected to leave enough extra around the edges of this quilt. At this stage it was less that 1/2" too big all round. I knew washing would increase the draw in. I was not that worried about shrinkage from my fabrics as they were pre-washed, but there is also a little shrinkage from the cotton batting and the thread and just the draw in caused by the quilting pinching the layers. I debated leaving out the washing but it was just not finished in my mind. 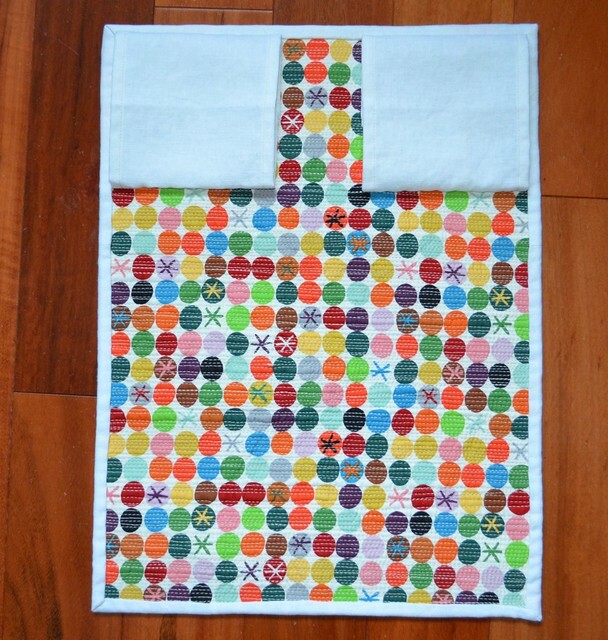 Since this quilt was for an awesome show, I had to add that last design element - the texture that washing would add. I crossed my fingers, asked my instagram friends to cross their fingers too, and threw it in the washer. I did have one hedge - I washed it before I bound it, so I also top stitched along the edges to make sure that the wash did not dislodge the quilting thread. I only dried the quilt in the dryer for a few minutes and then put it on my cutting table. It was 3/8" too small all round. Yikes. I could have started over then, but I was running out of time. So I blocked it, a lot. What does that mean? 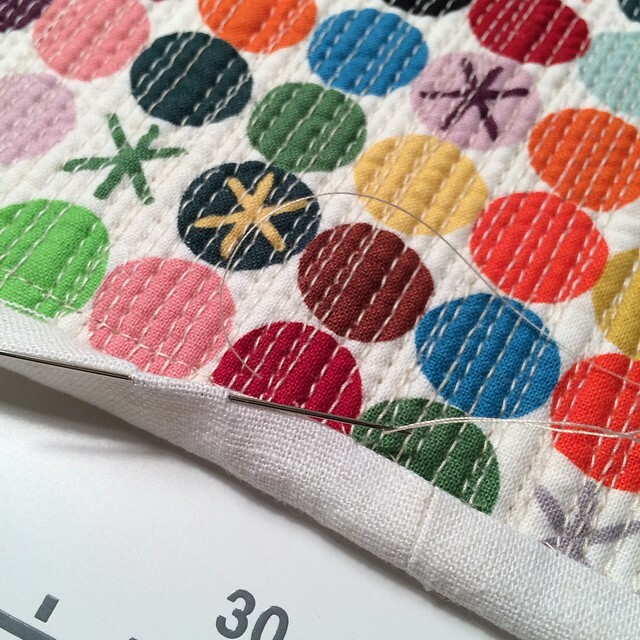 To me, it means that I very carefully - careful to not break the quilting threads, pulled the quilt along the horizontal and vertical, moving along in little bits. Then I set it back down on the cutting mat to measure, and did it again and again. I tugged corner to corner, again gently and carefully. After a while, the quilt was the right size. I left it to dry, checking it from time to time to make sure it was not shrinking in again. I flipped it and then I hung it on a hanger. It dried to the right size. Next time I will plan for the draw in better as the blocking did take some of the nice crinkle, but not all of it, out of the quilt. I added a single fold binding made with more of the Essex linen. 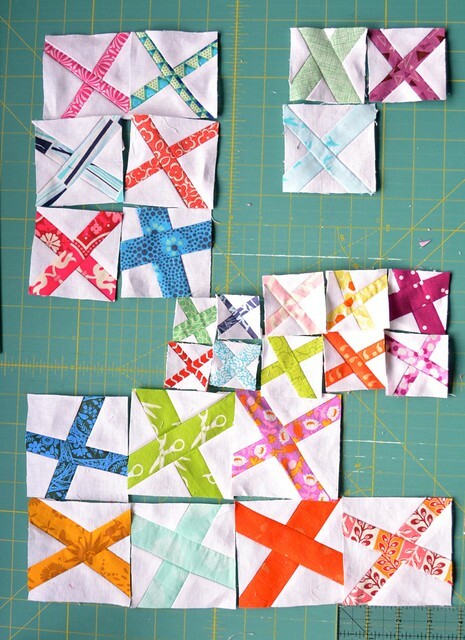 I always use a single fold binding on mini quilts, I think the regular double fold is just too heavy on them. You can see that I also join my bindings on the horizontal, as this adds to the industrial, functional look in my view. I picked this beautiful Alexander Henry print for the back. It is sure colourful, perfect for the theme. I added a split hanging sleeve as requested, and I did add a label before I shipped it off. There she is, Landmarks, 2. I considered a different name, but Landmarks (google the definitions) perfectly suited my plan. And since I am now planning a similar bed sized quilt, I guess it is another series for me. 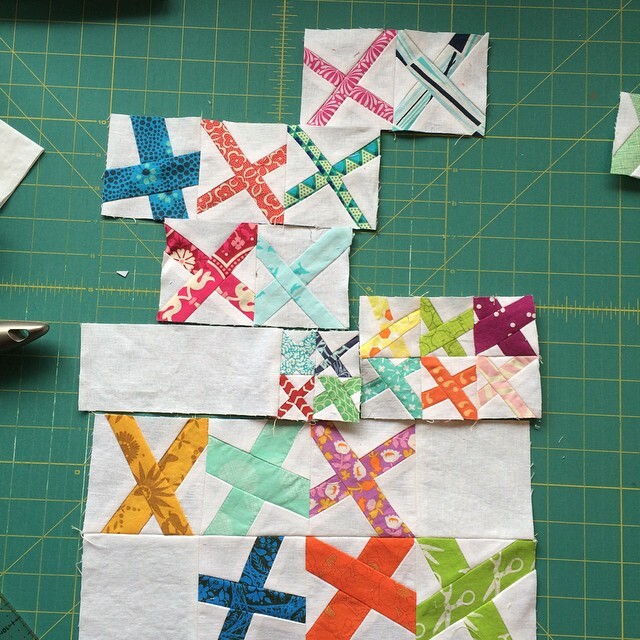 I am pretty sure exploring a quilting idea with a series of quilts has become another "thing" that I do. Now I have my fingers crossed that is will be seen as good enough for the show. 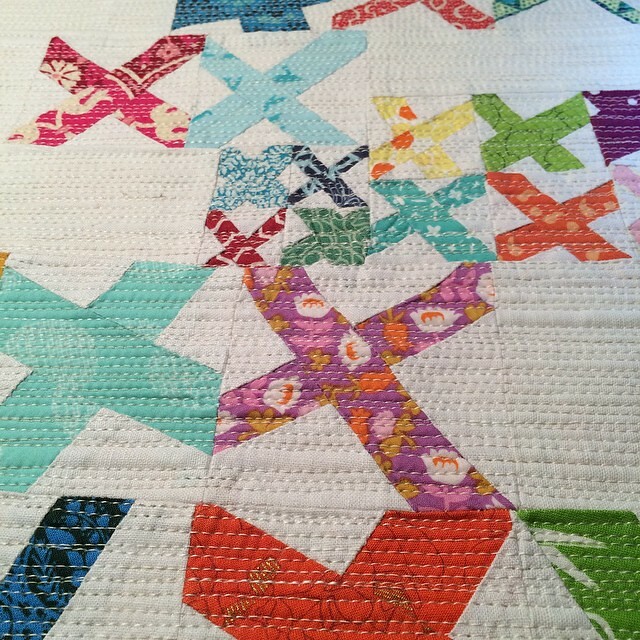 I see this quilt as also a Scraptastic Tuesday project, and more so the next bed size one. I did not get this done until Thursday, so I guess I am having a scraptastic week. If you have not yet seen Nicky's post for Scraptastic Tuesday, it is here, and worth a visit. Can you tell me about this split hanging sleeve? Our guild is going to have a display of minis and I was wondering how best to hang them. I haven't seen this before. The finished mini is great! It's stunning!! I hope we're going to see a photo of it hanging in the show? Wonderful quilt! I haven't moved into the "Modern" age as yet but your lovely quilt has certainly inspired me to have a go! Phew!!! It is brilliant and the quilting looks spectacular. So glad you could make it the right size! Congratulations! Wow! 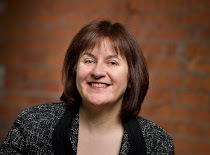 Great to read all about your process here Leanne! What a beautiful result! I'm impressed you can stretch it that much. I have 16 patch HSTs made by bee members some of which have bigger 1/4" seams than others so have ended up up to even 1" different in size. Would blocking work for them before sewing them together too do you think? I guess they haven't been quilted so there's no draw in to draw out perhaps?! 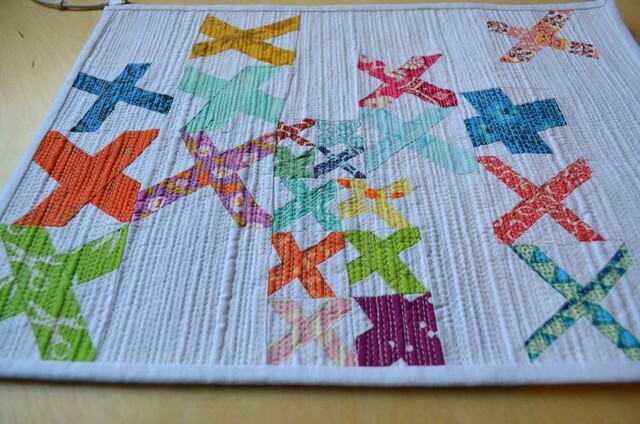 Love this little quilt! And what a fun way to use scraps. 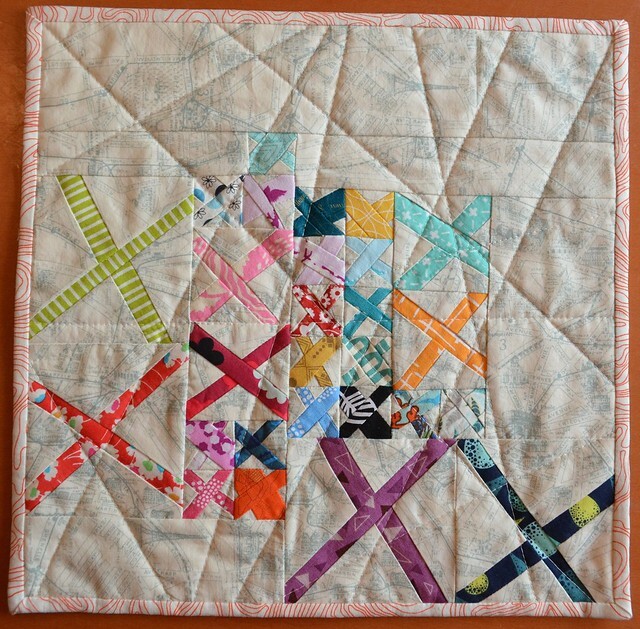 Great little quilt...and I bet all the "elite" quilters feel like posers. Thanks for sharing your process it's nice to know that you have some trial and error in there as well. Oh, I really like this mini! The quilting is great, and how special that you are part of this special traveling show. Chin up! It'll fit wonderfully within the exhibit! It is indeed a landmark quilt!!! It's just perfect! I love it so much. Great finish! Love the new take on your earlier Monuments mini. It's fabulous Leanne! Well done for for going modern (at which you most certainly are elite and no poser, I assure you). I am amazed blocking works after washing this way though I'm probably too much of a scaredy cat to try it, but then I'm not trying to meet a specific size for a show, I guess. Hope it wows the show! Whew! That all sounds so stressful! Especially about the size being too small. I confess I've never blocked a quilt - I need to read up on that just so I know more. Anyway, love the finish and how exciting to be in on this exhibit! This is really stunning! I love the way that you develop ideas through series, to me that's the mark of a true artist. It's lovely to learn about the evolution of your quilts, bumps in the road as well, especially when you end up with such a stunning result! Another beautiful finish. You will stand out in the exhibition. As always! so gorgeous and love the backing fabric ! You crack me up with your poser anxiety. Leanne, the fact they asked is a great honor! I'm so glad they acknowledged your super funky style and invited you - you're going to shine! Really a nice job. 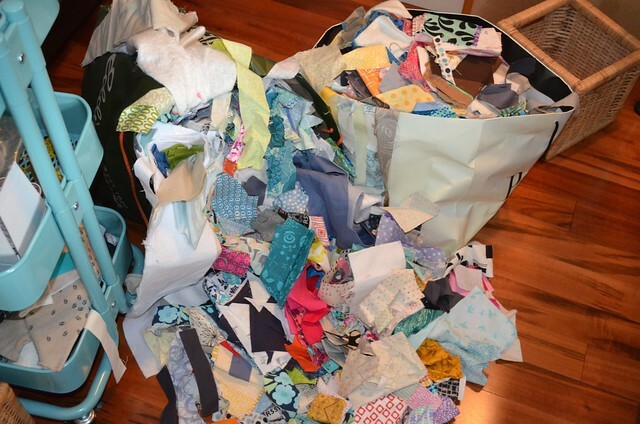 I find it fascinating how you design... just by looking at a pile of fabrics on the floor, and beginning to pick various ones to sew a block. Definitely improv, and you're very good at it. I would have stood there and hmmed and hawed for so long, I would have completely missed the deadline! 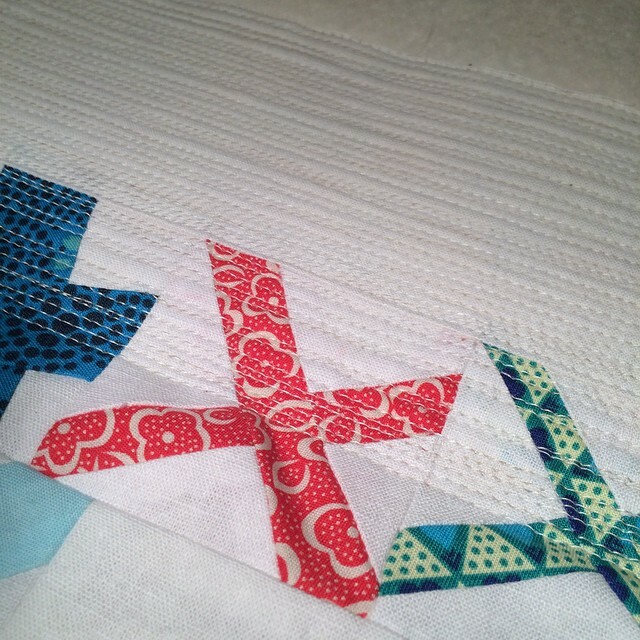 Good for you to continue matchstick quilting. I hope someday you enter a show and win a prize. A gift certificate for thread! Quite a journey already for your wee quilt - love the concept and wish you well in the show. Leanne - it's beautiful. I love the finished piece. Your choices were spot on every step of the way. It truly is fabulous and I'm sure that it will make it into the show. 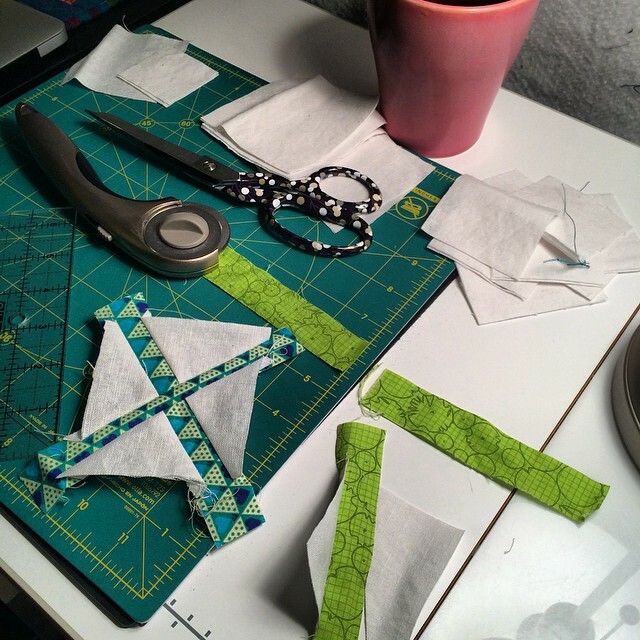 Your process is very inspiring, just grab the scraps and cut, & sew. Love how it turned out after you quilted it. It looks fabulous! I really look forward to seeing it in person at the show next year in Lethbridge. My guild is organizing it this time round, and I'm thrilled that I'll see the work of someone I 'know' when all is said and done. Of course it's good enough for the show - it's wonderful, and so "you"! I'm glad you were able to block it to the correct size (I've done that kind of thing myself, too). I'm going to be in Victoria next week, and I'm really looking forward to seeing all the quilts at the Satin Moon quilt shop.